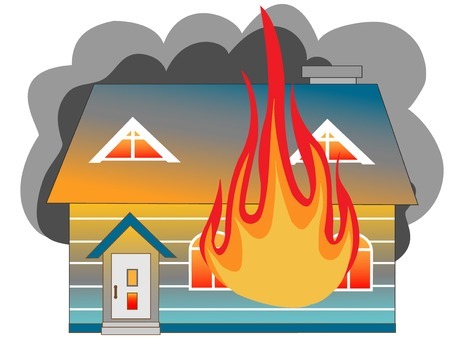 Winter Is Fire Season: Is Your Home Safe? Despite winter being the coldest season of them all, it is also the peak time of the year for home fires. That’s why it’s imperative to have a great fire alarm and safety system in place to help keep your home and family safe this holiday season. One reason behind winter being the most common season for home fires is due to all the cooking that is going on. Two out of every five home fires that are reported actually start in the kitchen for a variety of reasons, according to the National Fire Protection Association. The most common reason is that whatever was cooking was unattended for a certain amount of time, which accounts for one-third of the total number of cooking-related home fires. With a proper fire and safety system in place, you would be able to not only potentially contain the fire and smoke, but be able to make it out alive if the kitchen fire gets out of control. Another huge cause of fires in the winter is heating equipment. Without properly cleaning, particulates like creosote can build up inside chimneys and lead to a fire. These fires are among the most dangerous because they so often occur during the overnight hours when residents are asleep. You don’t want to put your life at risk, so make sure you have the best possible fire and safety system and that it is working at a high level to alert you to danger and give you the time to get out of your home in case of a fire. The holidays are also a common source of winter home fires. For instance, you may light a couple holiday-themed candles to help get everyone in the festive spirit, but it’s important to be careful where you set these candles and how long you leave them lit. That’s because on average there are about 25 home candle fires reported every day. The NFPA says that nearly 60 percent of home fires involving candles occur from placement near something flammable, so being conscious of where you set candles is important to keeping your home and your family safe. It’s also why having a proper fire alarm system in place is so important. An effective smoke detection and fire suppression system can quickly sound and alert you to any out-of-control candles that have erupted into a fire and help you and your loved ones get out of the home. At NYCONN Security Systems, we offer fire alarms and home security systems to help you keep you and your family safe, not only around the holidays but every day. These systems can be customized to meet the needs of your home, business or commercial structure and include public address systems, network connections and automated alert capabilities to send a request for assistance to first responders automatically. For more information on our fire alarms and security systems, contact NYCONN today in New York at 914-241-3700 or in Connecticut at 860-354-1947.